Michalis Pantazopoulos, has more than 30 years working experience in shipping and offshore industries in Greece and United States. Right after graduation with a PhD in Mechanical/Ocean Engineering, University of Washington, in 1987 he joined EXXON Corporation where for the next ten years served in engineering and managerial positions in offshore and marine engineering fields including 2 years of service as technical support to Exxon's legal team in the EXXON VALDEZ trial. Upon returned to Greece in 1996, he joined ABS Consulting (American Bureau of Shipping) in managerial positions serving the shipping and offshore industry in Greece and in south Europe respectively, followed by three years with AVIN INTERNATIONAL as Manager of the Fleet Services Division. Since 2004, Michalis is part of the Liberian Registry, the largest quality registry in the world, serving in their Piraeus office as Senior Vice-President. 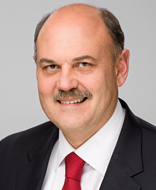 A regular speaker and contributor to shipping and technical magazines and journals, Michalis has been affiliated with several shipping and technical committees including INTERTANKO Associate Members Committee, Society of Naval Architects & Marine Engineers of USA and Greece where he served as President, American Society of Mechanical Engineers, Technical Chamber of Greece, HELMEPA, Propeller Club etc.